Today I am extremely excited to be working with TLC Book Tours and author Tori Raiten-D'Antonio to promote her book, Ugly As Sin. Below is my review, but let me premise it by saying I truly believe each and every woman should read this book. Amazing doesn't even begin to cover it. Toni Raiten-D’Antonio, LCSW, is a well-known psychotherapist with a thriving private practice in Suffolk County, Long Island. She is a professor of psychology and social work at Empire State College. Prior to becoming a therapist she worked in television and theater as both a performer and producer. She has two daughters and lives in New York with her husband, the Pulitzer Prize-winning writer Michael D’Antonio. I don't read much non-fiction, but when I do I tend to choose books that speak to me. From the moment I saw the title and premise of this book I knew it was one that I needed to read. I feel like I should premise this review with a quite note. I'm extremely intrigued by the notion of body image and how it affects people. After working around and directly with children for the last 14 years, I've seen the age at which children are struck by negative body image slide lower and lower. Due to this fact, I tend to devour any article that I find on the matter. 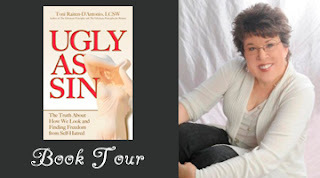 Not until TLC Book Tours offered me a chance to review Ugly As Sin did I find a book that compiles it all so neatly and beautifully. Toni Raiten-D'Antonio is both a psychotherapist and professor, and it shows in her work. The chapters are thoughtfully separated into sections that discuss the origins of "ugliphobia", how it relates to culture, what effects it creates, and how to overcome it. Her book is beautifully written, which I honestly find rare among non-fiction works. The accounts that she shares, the meaningful quotes that she puts in, it all comes together to create an extremely meaningful and fascinating account of how the concept of ugliness has evolved. What I enjoyed most about reading Ugly As Sin was how much of herself Raiten-D'Antonio puts into her book. There are multiple accounts of her own personal experience with the body image battle, and she even goes so far as to share candid stories from her childhood. A book like this is sometimes hard to read because it tackles the truth so well. I found myself nodding at times, teary-eyed at others, and fuming over the whole issue at others. It is hard to face the fact that we built this world for ourselves, and trapped ourselves in our own individual prisons. Ugly As Sin is, without a doubt, a book that I recommend to all women of all ages. Like I mentioned above, the age at which body image affects us as a society is slowly sliding lower and lower. I feel that if more women read this book, felt the empowerment, and took the steps to make themselves feel comfortable in their own skin, society as a whole would benefit from it! (Yes, that is my soapbox and I'm sticking to it.) I leave you with a quote from the book itself that I think will resonate with you, and I hope will encourage you to read this book. On-screen romance stories depend on the female lead being beautiful or just temporarily ugly. The transformation of so-called "ugly ducklings" is a hugely popular theme. In every one of these stories we learn that the fulcrum of a woman's value is her appearance. But take heart. With the right investment in fashion, and perhaps lesson in poise and etiquette, you can become a swan worthy of love. For more tour stops follow the book tour. Visit Toni Raiten-D'Antonio at her website.